I've been trying really hard to buy from small and independent businesses too, they usually have such amazing and unique things! I think buying from smaller, independent businesses is the really the way to go. There's something generic about mass retailers. Etsy makes a lot of personalized items and you can usually find something more unique in small shops! Etsy is great - I'm forever in awe of the incredibly beautiful things people can make! I love buying gifts for people more than buying things for myself! Personalised items are such a good idea, we got two of my friends personalised things this year - monogrammed leather looks super fancy for something extra special! I also like buying books for people, it's fun trying to think about what I've read that a certain person might like. Always so lovely discovering unique pieces! We draw names and pretty much only buy a gift for one person. We prefer that over getting lots of small gifts for a ton of people. Makes shopping a whole lot easier. That sounds like a wonderful way of doing things! Personalised all the way! One year, I hand-made/decorated a corkboard with travel photos/ticket stubs and was so pleased with myself... that said, you can't beat high quality and well-made products and independent shops are definitely great for that. I have a necklace from oh my clumsy heart myself and I really like it :-) Anthropologie is great for soy candles which lasts for ages! OmG nice stuff. I love funkopops and ofcourse UD such a nice brand. 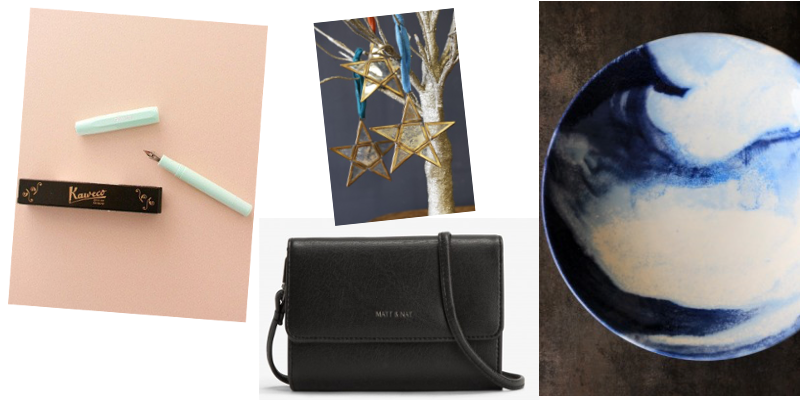 Most of the gift guides I have been seeing, although beautiful, don't have many ideas that would suit the people in my life, but I always have a thorough browse online for gift ideas anyway. I like to get started a little earlier and try and pick up some things in the black friday sales. I also like to do it earlier because I don't want anything to not arrive in time and mail seems to be slower around Christmas because there's more of it than usual. I thought I had most of my Christmas shopping done but have just realised I've got a few more people to buy for, so now I have an unavoidable trip to the shops coming up that I'm not looking forward to!